In a series of self-​portrait drawings the artist depic­ted him­self in his signature blue jacket, pul­ling on one end of a rope. 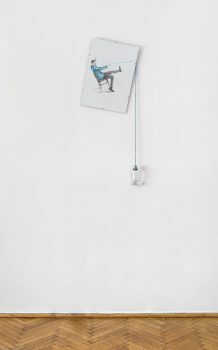 The other end of the rope is in fact real and attached to each drawing’s frame, with dif­ferent objects such as empty vodka bot­tles, ziploc bags with money or candy dan­gling from it and thus set­ting its balance. The knight’s armor alludes to the myth of the armed nation and its cur­rent pro-​family policy. “Performer” is the first exhibition of art presen­ted in the form of a full-​length film. The com­bination of artistic per­for­mance and cinematic action, paired with documen­tary footage and a fic­tional nar­rative, come together to create an astonishing pic­ture of the world of con­tem­porary art cen­tered around the figure of Oskar Dawicki. 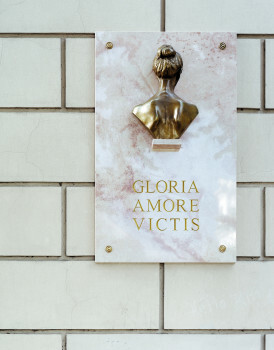 The clas­sical form of the stone plaque embel­lished with a bronze cast of the back side of a woman’s bust is dedicated to everyone who suf­fers and who has suf­fered in the name of love. 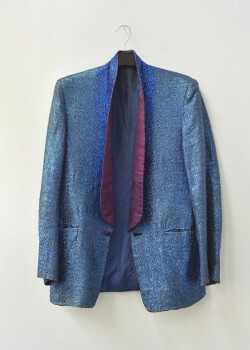 The blue span­gled jacket was given to Dawicki as a gift in April 1995 and has since become his trademark of sorts. A silver cast of the artist’s gullet. 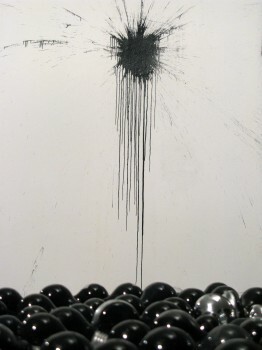 In the autumn of 2012 a 58-year-old man acted out against a pain­ting of the Bles­sed Virgin Mary of Czestochowa by throwing light­bulbs filled with black paint at it. 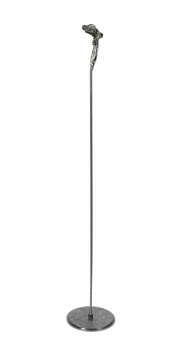 In con­sideration of the rhetorical and artistic valors of the use of paint as a weapon, Dawicki decided to apply that idea to the white cube of the gal­lery space. 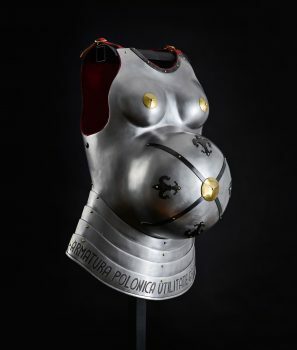 Dawicki car­ries out a spec­tacular display of appropriating and degrading of one of the most significant figures of con­tem­porary Polish art – the vic­tims of Andrzej Wróblewski’s Executions. Oskar Dawicki, a literary and film figure, an artist known as a prac­titioner of total per­for­mance, presents this time a dys­topian nar­rative: a kind of script, or more precisely a recon­struc­tion, of a per­for­mance originally direc­ted in a dream. The cen­tral figure in his vision is a pregnant woman, the heroine of our times, nourisher of the unborn but also caretaker of the dead. As befits a doub­ting artist, the world of his creation is full of ambivalence. One Piece Too Little is a treatise on the essen­tial nature of creativity. Dawicki raises the question of where the limits of spec­tacle are set with regard to art and to life – of the dif­ference between a show and one’s destiny, between represen­tation and recreation, between a work of art and its profanation. 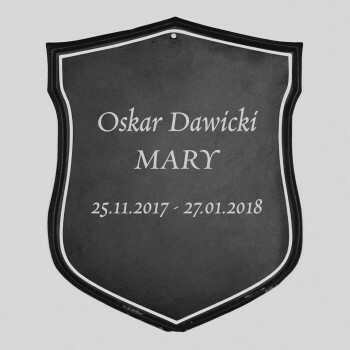 Oskar Dawicki, born July 28, 1971 in Warsaw, is a performer, artist working in film, photography, sculpture, installation, illustration and text (i.a. poetry). Graduate of the Faculty of Fine Arts at Nicolaus Copernicus University in Toruń (received his diploma in painting in 1996). 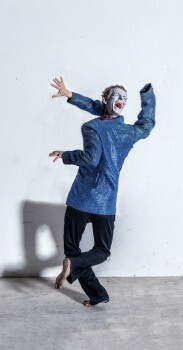 He cites Zbigniew Warpechowski (born 1938), a pioneering artist of the performance genre, as his mentor. They met while Dawicki was still a student, although he wasn't taught by him per se. Between 2001–10, Dawicki was a member and co-founder of the Azorro group, known for its series of ironic video works that deconstructed the institutional lexicon and practices specific to the contemporary art scene. He currently lives and works in Warsaw. Dawicki brings scepticism together with a tragic-romantic component, suffused with his own existential ruminations, along with the poetics and critical guise of conceptual art. Self-reflection upon his status as an artist is snugly interwoven with musings on the ethereal and feeble nature of one's own identity. Humiliation, discomfort, confusion, complication—these ideas make up the foundation of his artistic imagination. For Dawicki, the fruitlessness of art is its most promising aspect. 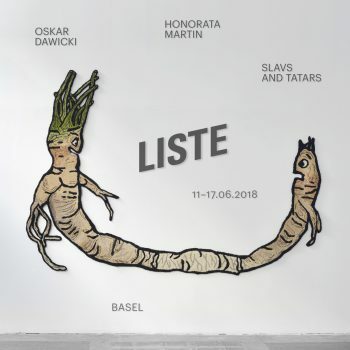 Dawicki's works and performance pieces have been shown across Europe and the United States, at such venues as the Tate Modern in London, the Museum Abteiberg in Mönchengladbach, Folkwang Museum in Essen, Hayward Gallery in London, Kunsthalle in Vienna, Kunstwerke in Berlin, Witte de With in Rotterdam, Muzeum Sztuki in Łódź, as well as the National Museum and the Museum of Modern Art in Warsaw. In 2010 a novel was written about the artist's life (Łukasz Gorczyca, Łukasz Ronduda, W połowie puste—literally “half empty”). 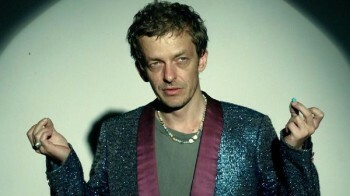 In 2015 the feature film Performer, inspired by Dawicki’s art and directed by Łukasz Ronduda and Maciej Sobieszczański, was released. And several perfomances around Poland and Europe.